Last night, I was missing my friend Deborah, and I she was making lamb chops for dinner. (I swear there are times when I do talk about something other than food.) So, I thought that I would also make some lamb, that it would be simpatico. The cuts of meat are very different in Italy, than they are in the US. Yes, you can buy traditional style lamb chops, but for the most part, Umbrians prefer some fat, gristle and bone with their lamb. That’s because fat, gristle and bone all impart flavor. You have to gnaw your way through Umbrian lamb. 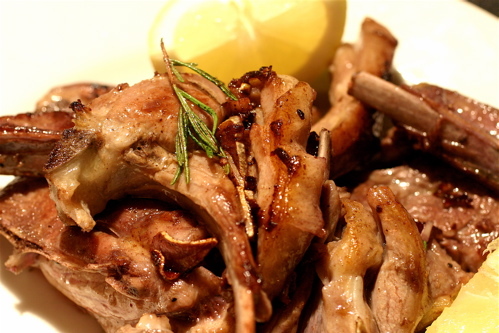 Here’s a simple way to prepare some lamb chops, or as we had last night, lamb ribs. Rub the meat with some seasoned salt. Currently my seasoned salt has: sea salt, black pepper, grains of paradise, orange and lemon peel. Looks like dirty salt, tastes great. Let the meat sit for 20 minutes or so until it comes to room temperature. Heat a heavy frying pan to medium hot heat, without any oil. When the pan is completely hot, add the oil, and then add the meat, turning the pieces as needed. About a minute before they are done, add some chopped garlic, rosemary and a shot of red wine. Reduce the wine and serve with a piece of lemon. Well that’s the meat, so where was the magic? 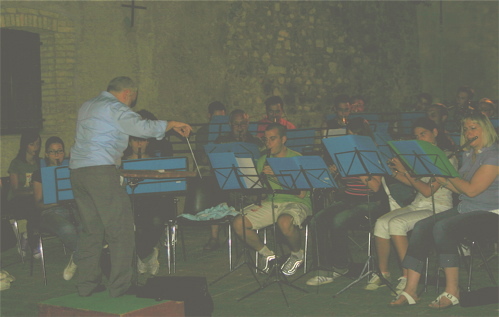 As I was chopping and prepping, our town orchestra decided to have their rehearsal. They set up in the little piazzini across the street from us, and as the music started, all the different neighbors poked their heads out to listen. When they finished the first piece, you could hear scattered applause up and down the block. So, we had an orchestra playing outside our window while we ate dinner. Not too shabby. Wish you were here to share it with us. ← There is finally food in the house!